After the debut of the seven-seater version of the Tata Harrier, the homegrown automaker could launch a coupe iteration of this SUV as well. Tata Motors pavilion at the 2018 Auto Expo and the automaker’s presentation related to its future product portfolio gave us an insight into what does the future hold for this homegrown automaker in India an abroad. The introduction of the Harrier marked the beginning of this new chapter for Tata in which we are now going to see the arrival of, what we expect, some truly amazing products. Based on just two platforms, the Alpha and the Omega, the future line-up of Tata Motors is going to include a wide array of body styles. From hatchback to seven-seater SUVs, from Micro-SUVs to an SUV Coupe, the list includes it all. There have been several reports stating that the automaker is going to showcase the seven-seater version of the Harrier, 45X based premium hatchback and its electric version along with the concept for the Micro-SUV at the upcoming Geneva Motor Show this year. The future product portfolio of Tata Motors, including the Harrier and the 45X hatchback along with the Micro-SUV were part of a presentation showcased by the company at the 2018 Auto Expo. In addition to the above mentioned products, there was also a coupe, based on the OMEGA architecture showcased in the said presentation as well. This coupe will be based on the Tata Harrier and is likely to follow the launch of the seven-seater iteration of this SUV. The future line-up of Tata Motors is going to be a global one, including the Harrier. What this means is that the automaker plans to launch this SUV along with the 45X based premium hatchback in European countries as well. There are chances that this coupe might not come to India. However, if launched in India, the Tata Harrier based coupe will fall in the INR 20 lakh to INR 25 lakh price range. Upon its launch, this vehicle will not face any direct competition. That said, Mahindra too has showcased an XUV500 based coupe at the 2016 Auto Expo. What an interesting battle will be if both these vehicles launch in India? 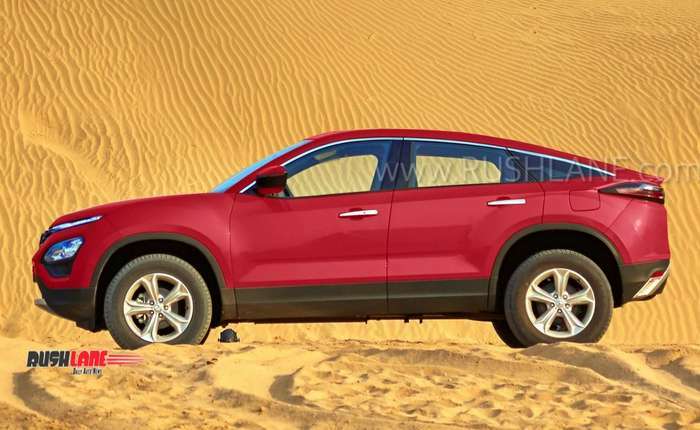 In terms of its engine specifications, the Tata Harrier coupe is likely to get the same engine line-up as that of the seven-seater iteration of this SUV. This means that under the hood, it will sport a 2.0-litre diesel engine pumping out 140 BHP of power along with 350 Nm of peak torque. Transmission options will include a 6-speed manual and a 7-speed torque converter automatic gearbox.